No, you did not miss new year's resolution update #2. I jumped from #1 to #3 because #2 relies on me actually finishing out the year. These others I can go ahead and update on because I discovered some lessons learned about them and I'm not quite as die hard about accomplishing them in the exact form I started out with. So resolution #3 was to "Simplify My Schedule." At the time, I was pretty much meaning I wanted to trim down my commitment list and get in the habit of not taking on new commitments "unless they are required of me or I am the only person that can do them." I know it is not healthy to be over committed and stretched too thin, and I have indeed cut a few things out of my schedule. But I think I have learned that the answer is not to chop up my commitment list and walk around with a sign on me that says "Don't bother asking me to help out with anything because I am too busy already." I think the answer is to find the right balance of commitment time and renewal time. This hit me like a brick when I read a part in Joanna Weaver's book Having a Mary Heart in a Martha World, which I recently finished. She started out by talking about how she and her younger sister would spend time at their church camp playing on the teetertotter, how they loved going up and down, up and down, and sometimes would try to find a perfect balance so they were both suspended in mid air. Joanna would have to scooch forward on the board a bit since she weighed a bit more. They'd sit there in perfect synchronicity for a few moments until one of them would suddenly scooch their bottom backwards, making their end sink and the other sister go flying upwards. Here's something I've discovered about balance. Being balanced is not so much a matter of staying in perfect equilibrium as it is a matter of finding the right rhythm for our lives. You see, that pure spot of synchronicity my sister and I liked to find on the teetertotter never lasted very long. We spent a lot more time going up and down than we did hovering in the middle. In fact, that's partly what made it fun. As long as we kept ourselves going up and down, it all equaled out. 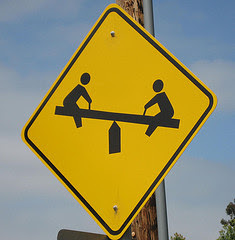 We could teeter and totter to our hearts' content and still stay more or less in balance. I've found that helpful to remember in my own life. Because, practically speaking, the balance between Living Room Intimacy and Kitchen Service more often resembles the up-and-down, back-and-forth motion of the teetertotter than it does that fleeting moment of synchronicity. One side of my life may take predominance for a while, then the other. One day I may spend several hours in Bible study and prayer, settling softly on the side of intimacy with God, while the next day is given over to volunteering in my daughter's classroom, teetering over toward the service side. If you were to gauge those two days individually, they would appear totally out of balance. But not when you consider them together. That's the beauty of dynamic, teetertotter balance. As long as my heart is set toward both service and worship, I don't have to feel guilty when my life seems to settle longer on one side because I know I'll eventually push off from that spot and spend some time on the other. The very up-and-down rhythm can actually keep my life moving in a positive direction. Our lives are meant to be dynamic, not static. Like a clock pendulum or the pump of an oil well, the rhythm actually generates energy for our lives. The truth is, we thrive on a life that is rhythmically balanced, not standing still. When I came up with this new year's resolution, I was hoping to totally knock out a lot of commitments, to eliminate the stress and busyness that sometimes (ok, often) pop up, to have tons of time for ME, to be calm, rest, renew, take bubble baths, journal, read. What I realized is that if I truly eliminated all of the stuff that can cause stress and busyness, how boring would my life be? Not to mention lonely because there's no way we can reduce my husband's commitment list since his busyness is part of his job. It's not about finding a constant, unwavering sense of being calm and collected and on top of things. Life happens, all around us, and it would be selfish to try to shut all of it out just to try to accomplish some ideal feeling of un-busyness. Trent and I get into super busy spells, oh that's for sure, and sometimes they last a long time. Usually by the time things calm down we are very ready for a break, and we intentionally seek those out, sometimes in the form of a weekend getaway after an especially extended time of craziness, or even just an intentional afternoon at home to watch a movie together after a busy week. He has made a practice for a while now of scheduling Sabbath times into his week, a time to be purposeful about renewing his spirit, either through Bible reading, devotions, journaling, praying, etc. I have begun to try to make a habit of this as well and find I really enjoy it. It kind of recharges us to get up and go once again when a new busy week or month starts. This will still take some figuring out. I'm not sure yet what the right balance looks like for my/our life. Didn't help that it took me almost the whole year before I read this book! I think something I will have to remember is that I can't just stay afloat during busy times and then hope for calm times to show up. We are indeed busy people and I'll have to be somewhat intentional about injecting the calm times, the Sabbath times into our schedule.